That is the lowest rate of adult smoking since the CDC’s Nation Health Interview Survey (NHIS) began keeping such records in 1965. The report also shows the number of cigarette smokers dropped from 45.1 million in 2005 to 42.1 million in 2013, despite the increasing population in the U.S. 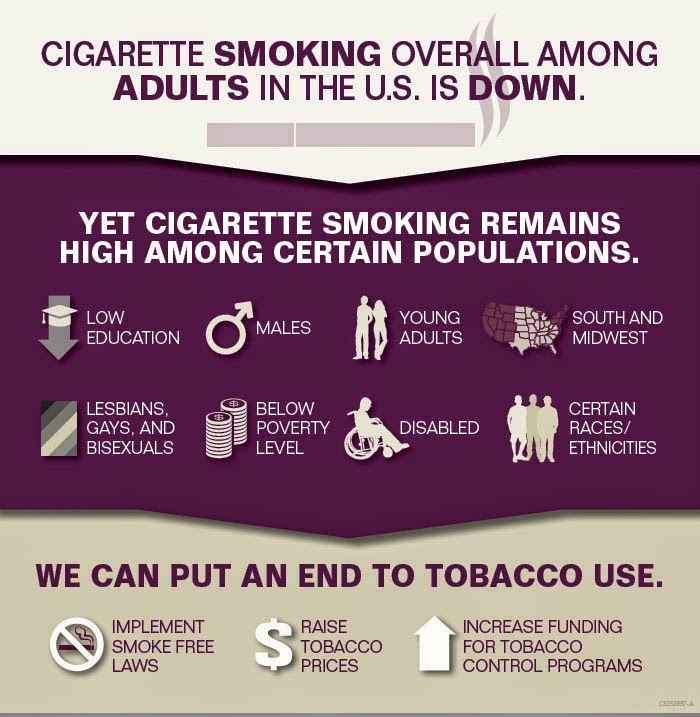 While this news is encouraging, there are still several populations that are disparately affected by tobacco use, both in the U.S and Colorado. The Colorado Tobacco Education, Prevention and Cessation Grant Program's 2012-202 Strategic Plan aims to reach and support several priority populations, including many of those mentioned in this study. These populations include low socioeconomic status adults, straight to work young adults, youth, LGBT adults and more. There are many free resources available in Colorado to support people in their efforts to quit tobacco. Tobacco users in Colorado can get free coaching, and nicotine replacement therapy by calling 1-800-QUIT-NOW or visiting COQuitLine.org. To view the full MMWR report click Here.